Launched in late 2018, the New Zealand Society of Authors (NZSA) Oral History podcast delves into the organisation’s archives, sharing authors’ stories of ‘fighting institutions, government—and sometimes, each other—to advocate for writer’s rights’, according to host Karyn Hay. 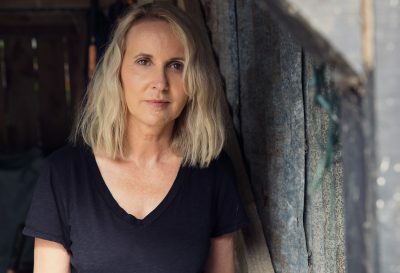 The podcast ‘is an inside look at surviving as a writer and the battles NZSA authors have fought on behalf of all writers in Aotearoa’, said podcast producer Elizabeth (Libby) Kirkby-McLeod. She spoke to Books+Publishing for our ‘podcast spotlight’ series. For new or uninitiated listeners, describe your podcast in under 50 words. Spanning 30 years, involving four interviewers and including over 20 writers, the New Zealand Society of Authors (NZSA) Oral History Podcast digs deep into the NZSA archives to hear New Zealand authors tell their story of living as a writer in Aotearoa. The podcast is hosted by Kiwi broadcaster and author Karyn Hay. What makes your podcast unique? The original NZSA Oral History Project involved preeminent Kiwi historians recording the histories of our preeminent authors. These interviews have been held in the New Zealand Alexander Turnbull Library for over 30 years. However, after the death of several of the participants including Michael King, Christine Cole Catley and Lauris Edmond, it was realised that we had something special squirreled away in these recordings; we had the author’s own voices. As Jenny Nagle, NZSA CEO, says, ‘The social history and intimacy of the interviews are compelling.’ The NZSA Oral History Podcast is an inside look at surviving as a writer and the battles NZSA authors have fought on behalf of all writers in Aotearoa. When and how did you get started in podcasting? This is the NZSA’s first move into the podcasting space. However, NZSA has been able to bring together some passionate and skilled people to coordinate the project. Our host Karyn Hay is an experienced broadcaster, and producer Elizabeth Kirkby-McLeod has produced for radio in the past. Where and how is your podcast recorded (and how big is your team)? Well … ! Many of the original episodes were on tape so these were digitised for us by the Alexander Turnbull Library (part of the National Library of New Zealand). Karyn Hay is a broadcaster and is able to record her voice scripts in her studio and these pieces are then edited together at the NZSA office by Elizabeth Kirkby-McLeod. To pull these episodes together requires a lot of goodwill and generosity! What kind of listeners does your podcast reach? So far our listeners are mostly from New Zealand. Our 1600+ NZSA members are interested in our shared history and, of course, readers are interested in certain authors. What have been your most popular guests or most memorable episodes? Everyone will have a different author they love but so far the interview with New Zealand poet Lauris Edmond (now deceased) has been our most popular. People need to listen to the latest episode with Kevin Ireland, though. It’s fantastic, full of death threats, bitter rivalries and underground bunkers—and that’s just at the NZSA meetings! What recent trends have you noticed in podcasting? Do you have any predictions for this format in the future? Podcasts that make sense of our current political moment are very popular right now. And gosh, the true crime genre goes on and on, doesn’t it?! Creators of other content, like radio, TV and newspapers are really investing in podcasts, which is great from a standpoint of quality. But I hope they don’t drown out those who do it for love. Why do you think people are drawn to this format? Because people spend so much time commuting. It’s a dull reason I know, but smartphones, mobile data and savvy podcasting apps have made it a great way to use your time on the train or bus. How do you fund your podcast? Do you have plans to explore other funding options? Our current podcast series is funded by NZSA and Creative New Zealand. What plans do you have for your podcast going forward? We still have plenty of interviews from our literary history to work through. The hope is for another round of the Oral History Project to occur to get us more content. What other bookish podcasts (or podcasts for people who love reading, writing and sharing ideas!) should we be listening to, Australian or otherwise? I love the New York Times Book Review Podcast and Poem Talk from the Kelly Writers House at the University of Pennsylvania.